The Home of the Rock, Beautiful Sunsets, Fishing and Great Food! 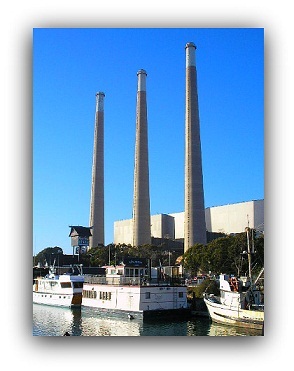 Morro Bay, California is full of history and brimming with great shops, sites and adventure. 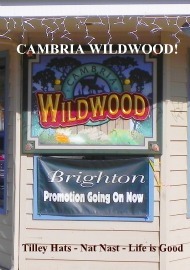 We live in Cambria and next to Cambria the bay is our favorite place to shop, eat and enjoy long walks on the beach. The Bay is a special place on the Central Coast of California. If you are looking for a fishing trip, fine dinning or a walk on a beautiful beach... the bay is the place to go. The Rock is absolutely incredible. You have to get up close to the rock in order to fully appreciate its size and splendor. Birds circling, waves crashing, surfers surfing and a cool breeze in your face is what you get when you visit the rock. It is spectacular. The first time I visited the rock I couldn't believe my eyes. This gigantic bolder bulging up out of the water sparked my imagination. It looked like a space ship. It seemed like a mistake. Why did this rock just pop up next to land. I had lived on the Gulf Coast of Mississippi but I had never seen anything so majestic. My wife took took me to the parking area next to the rock and I was astounded at the amount of sea gulls on and around this big old rock. I mean to tell you, I had never in my life seen so many sea gulls. When you visit the Bay make sure to take time to drive out to the rock. The beach is beautiful, the birds fascinating and the rock is unbelievable. 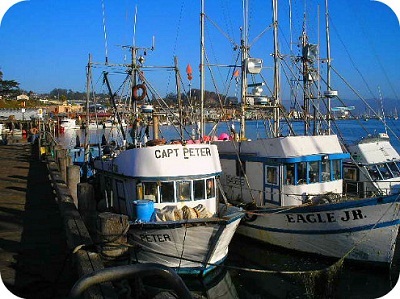 Fishing boats nestled against the pier of the embarcadero remind me of days past when the bay was a thriving fishing village. Unique little shops with unique products, sail boats, fishing rigs and seals line the beautiful bay. The smell of salt air and fresh fish mingled with the scent of cooking food makes the bay different and wonderful to visit. When visiting this area you can't help but notice the stacks. Maybe the stacks were the mistake. If you have never been on a fishing trip in the Pacific now is the time. You can charter a boat and fish till your nets are full. 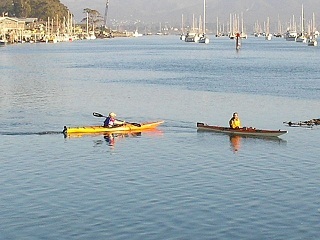 You can go whale watching or just rent a kayak and take a slow ride through the bay. 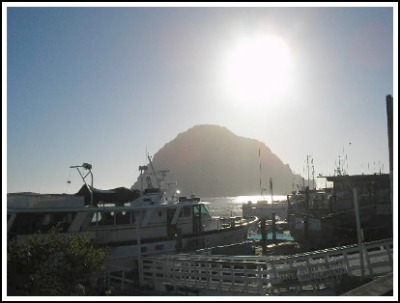 Regardless of what you choose to do in Morro Bay you will have the time of your life. 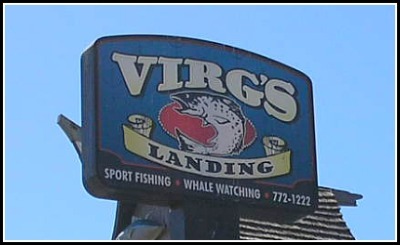 One of the best places in Morro Bay to charter a fishing boat or go whale watching is Verg's Landing. For more information click on this link Verg's Landing. My comment when seeing the stacks,"what in the world are those?" They just didn't fit into the landscape. How weird to put three big poles up in the middle of paradise. After five years I am still amazed they actually put those things up. I have never seen any other down, in any state, with three stacks rising into the sky. It is a paradox, something so ugly in the middle of something so wonderful and natural. DO - First you have to go to the Rock and watch all the birds. You can't fully understand how big that rock is until you get close. From the rock you can see the sights of fishing, Sea Otters and much more. While in the bay you have to take a leisurely stroll along the Embarcadero. Unique shops line the streets and you can even find salt water taffy. There is so much to do and see in this area. We are going to include a complete list very soon. Remember this site is new and we are working day and night to get things up and running. 1. For Information on the Embarcadero Click Here. 3. For information on reoccurring events Click Here. 4. For a complete business directory Click Here. 5. Check out the Boat Parade Click Here. 6. Hunt for Sand Dollars Click Here. 7. Visit Morro Bay Beach Click Here. 8. Sunsets on the Beach Click Here. 9. Whale Watching Tours Click Here. 10. 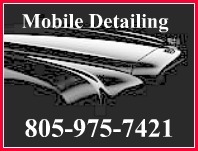 Private Charters Click Here. 11. Salt Water Fishing Click Here. 12. California Sea Otter Watching Click Here. STAY - The bay has a wide selection of motels and Bed & Breakfast. You might be interested in camping in one of the state parks. Don't worry there are plenty of places to stay. Vacation rentals are also available. 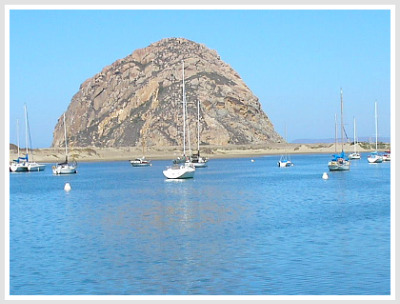 The motels and hotels in Morro Bay stay book so make sure you make your reservations in advance. I suggest you use Kayak to set your reservations. EAT- We drove to the Bay just the other day. It is a beautiful drive from Cambria to the Bay. We stopped and had the best fish and chips at one of the local places, right on the bay. We watched an otter swim by and then spotted a seal. If you like to watch sea life and eat, this is the place. The bay also host a number of places to eat. Fine dining, casual dining or maybe just a quick hamburger, whatever you are hungry for is located in our unique list of eateries. Some of the restaurants will even allow your dog to dine with you. For help in planning your dining experiences Bay Dining.